Electric Boat (a General Dynamics division) designs, builds, and supports the life cycle of submarines for the U.S. Navy, with primary operations at the Groton, CT, shipyards. 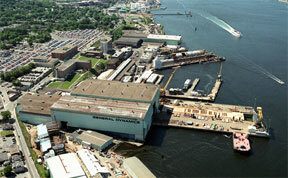 The heart of the Groton shipyard is its Land-Level Construction Facility, where submarine hull sections are assembled. As part of a $20 million upgrade, Electric Boat wanted to make access to submarines in the assembly process easier, faster and safer. Before the upgrade, workers at the final assembly building were forced to climb scaffolding stairs to build submarines. A new platform was installed that allowed them to easily access the tops of submarines without returning to various shops for tools. The top of a Virginia class submarine can be as high as 40 feet, meaning that workers had to constantly climb stairs. To solve these issues, Electric Boat decided to install new, fixed multilevel platforms to access the submarines. The platforms run parallel to the the top of the Virginia-class submarines being built in the facility. Workers can store equipment and tools on the platforms. Besides allowing easier access and eliminating the need to go get tools, the platforms also offer the ability to overlook submarines easily and quickly. This allows EB's employees to look at the boats while holding plans and other documents. Freight is moved to the tops of the platforms by two large vertical reciprocating conveyors. The straddle-style VRC's each have 8,000 pounds of capacity. The first is 52 feet tall and the other 59 feet. Each has three levels with an 8' x 12' carriage. They are used to lift materials to workers at different work platform levels. The workers are transported to each level of the platform structure by personnel elevators and do not ride the vertical lifts. Burns and McDonnell, the project's general contractor, wanted a turnkey source for these VRC's, with drawings and quoting all the way through the installation and sign-off, to be done by one company. Cisco-Eagle fulfilled that role utilizing Pflow Vertical Conveyors. Since the upgrades, workers are now able to effortlessly move to necessary positions. Countless trips up and down scaffolding and stairs have been eliminated. The project has allowed the shipyard to cut costs and maintain its employee base. Every change to the facility was designed with health and safety issues in mind. By going vertical, Electric Boat has managed to cut costs and boost productivity. Overall, the improved efficiency will save $81 million over the remainder of the Virginia program, according to company officials. The changes will result in a 10% reduction in manpower hours. Electric Boat believes that its commitment to cost reduction has helped win Congressional support for the submarine program.